I recently bought a second hand 2005 Toyota Prado GXL 120 series running 265/65R17 tyres. “What tyre pressures to run?”, was one of my first questions. After reading my Toyota Prado handbook, searching the internet and asking a tyre (tire) dealer about what tyre pressures to run on my Toyota Prado, I had three different answers — here are my results. The Toyota Prado owner’s manual states that the standard cold tyre inflation pressure is front 190 kPa (28 psi); rear 190 kPa (28 psi). This seemed a little low to me. Internet research indicated people were running their tyres around 32 psi up to 42 psi depending on the load carried, road surface and speed. Based on the above, on my trip to Tasmania (6,700 kilomtres in 23 days! ), I ran 36 psi front and 38 psi rear. I was travelling mostly on sealed roads carrying a couple of hundred kilograms of gear in the boot. Given that my Cooper Tires are covered by a warranty that requires correct tyres pressures to be maintained — and I have the above in writing from the Goodyear service centre — I follow the advice from the tyre dealer. My recommendation though, is to ask your local tyre dealer. If you have just invested $1500 in a new set of tyres, you want to look after them don’t you? 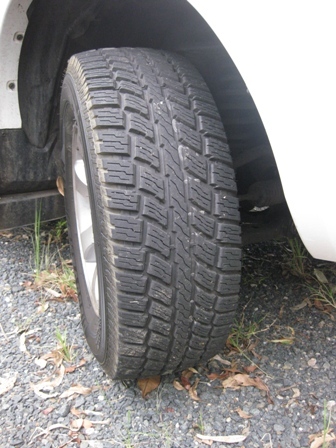 Tell your tyre dealer the type of driving you will be doing (road/offroad, highway/city, loaded/unloaded) and they should be able to confidently recommend the correct tyre inflation pressures for the application. If they can’t, then take your business elsewhere! This entry was posted in Maintenance and tagged 4WD, 4x4, Cars, Off Road, Sand, Tire Pressure, Tyre Pressure on 2 March 2011 by Rex. Thnx for the advice about the tyre pressur. I was wondering the amount to put in my tyred and am already at the shell trying to. Tyre pressure advice can be confusing. I have found the advice from the tyre dealer to be reliable over the last 25,000 km, which includes use on-road, highway, four wheel drive tracks and fully laden with camping gear. It also includes two Cooper Tires maintenance intervals (rotate and balance) that would have picked up any developing problems from incorrect tyre pressures.